Happy Monday, friends! We had a rainy, cool weekend, which was a nice way to usher in fall. We usually don't get cool weather like this in September, so it was a treat. + It was drizzly and nasty outside, so I took the boys to Toddler Time at one of our local indoor trampoline parks to get some energy out, and then drove through Chick-fil-A for them on the way home. + Early Friday evening, we picked Brandon up from the airport. He made it in just as the weather was getting horrible, and I was so thankful and grateful both he and his luggage made it just in the nick of time. + We had dinner together as a family at TruFire, one of our favorite places. Their spicy garlic noodles cannot be beaten! + We came home, watched the Texas Senator Debate and called it an early night. I was beat! + Brandon and Walker were up early, so they ran out to get us some donuts. 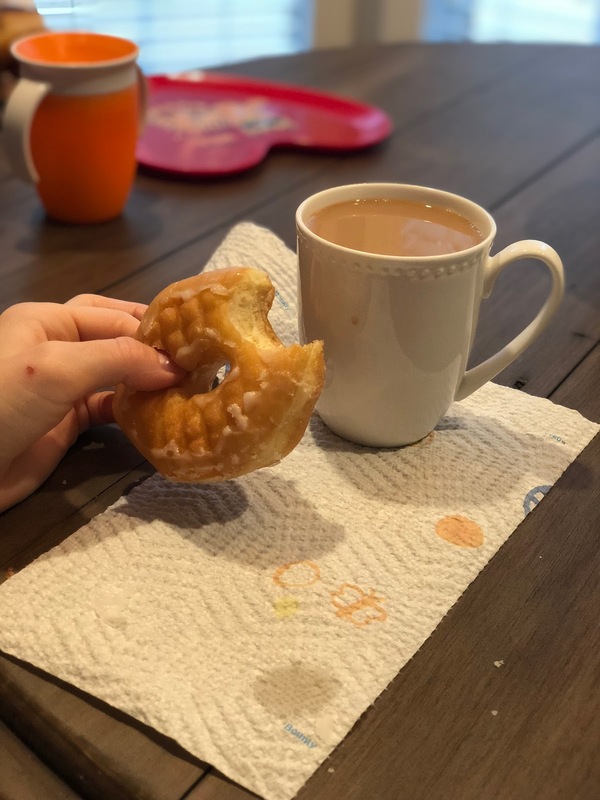 I love donuts and coffee on a rainy Saturday morning! + The boys played and got some work done outside while I cleaned the house and did some laundry. I finally sat down to watch the tail end of "Father of the Bride" and started "Father of the Bride: Part II." They are such great movies and some of my very favorites! + My brother, his girlfriend and our aunt came over and we got to visit for a while, and we watched the Baylor game once they left. The boys both took epic naps and we couldn't stop laughing at Knox's post-nap hair. + I made Crock Pot BBQ Chicken (which I served over sweet potatoes and topped with coleslaw) for supper. We watched some more college football before calling it a night. + Another rainy, yucky day, but we made it out to church. Walker learned all about The Tower of Babel in Sunday school and loved telling us all about that; I love seeing him hide God's Word in his heart! + After church, we headed out to brunch at FnG Eats, one of our favorite farm-to-table restaurants. I absolutely love their Pot Roast Eggs Benedict and Brandon can't get enough of their chicken and waffles! Love my two guys in their buffalo check! Knox is giggling because he devoured a waffle, scrambled eggs, fruit and polished off most of Brandon's fruit, too. I seriously wonder where it all goes! + Our Sunday afternoon was nice and slow: football on TV, naps for everyone, some laundry, and I made white chicken chili in the Crock Pot (and served it with cornbread). It was so delicious and perfect for a cool, drizzly fall evening. I am so happy to hear that you, too, had a Fall like weekend. The weather finally broke and I couldn't be happier! E loves the trampoline park and begs to go. I wish I could take her on a weekday. His hair.. too darn cute. We've had so much rain lately and again today - I always love seeing what you do with the boys so I can get ideas for Tatum when he's a little bigger - can't wait for his first Chick-Fil-A run! I'm going to have to try that white chicken chili recipe. Those donuts look delicious too - that is such a guilty pleasure of mine. And Knox's post nap hair is the cutest. Happy Monday! Those are some of my very favorite movies ever! They make me bawl every time.